Available Installation Kit includes plumbing components required for “universal” installation of water supply and drain for easy installation by a plumber. 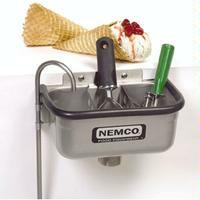 Spade Well Ice Cream Spade Cleaning Well has a stainless steel body and is equipped with a rubber bumper. Spade Well models are listed with the National Sanitation Foundation (NSF).